HomeTrendingKylie Jenner shares first few selfies with her gorgeous baby girl, Stormi Webster! Kylie Jenner broke the Internet when she shared a glimpse of her newly-born baby girl, Stormi Webster a few weeks back. Stormi is now only 7 weeks old and well, being half a Kardashian, she sure has perfected the pout already! The 20-year-old lip-kit mogul recently shared two adorable black and white selfies of herself along with her gorgeous baby girl and they're all things adorable! Kylie took to Instagram on Friday to post these two black and white selfies. Kylie puckered her famous lips in one as she cuddled her bundle of joy while Stormi stared on. One thing is for sure, Stormi is surely taking over from her mama in terms of looks. They both have jet black hair and piercing brown eyes. Let alone that famous pout! This mother-daughter duo is simply the cutest and there is no denying it! 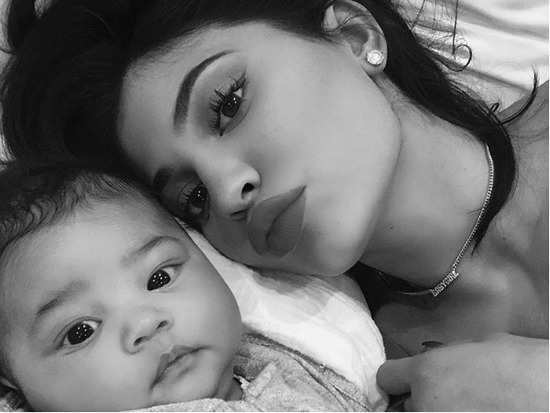 Kylie, if you go on posting these adorable baby pictures, you're seriously going to break the Internet (literally)! 1Kylie Jenner shares first few selfies with her gorgeous baby girl, Stormi Webster!